The company was founded by its current owner/director, Colin McOwen, 1992 – 2017 marks our 25th Year in the industry. Although the majority of our clients are based in the Western Cape, we do also service numerous clients throughout South Africa, Africa, and overseas. We currently house various departments under one roof that offer our clients the full spectrum of services/products they might require. 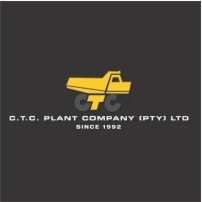 CTC Plant Company permanently employs more than 80 staff members at present. Our primary focus is on the Construction, Civil Engineering, Agricultural, Forestry and Mining Industries. Tags: wheel loaders, excavators, bulldozers, motor graders, pavers, cold planers, skid steers, backhoe loaders, rollers, forklifts, truck mounted cranes, crawler cranes, pipe layers, mining dump trucks, dynamic compaction machines and concrete equipment, filters, filtration, components, oil, parts, engines, diffs, differential, transmission, gearboxes, pumps, tyres, belts, forestry, agriculture, hire, machine hire, cranes, crawler, tempo, tempo attachments, mining, new parts, used parts, spares.